Tip: Use a big bowl for this recipe as it makes a big batch and you don’t want batter splattering everywhere! Preheat oven to 350F. Lightly grease your muffin tins. Cream together the butter, sugars and salt until light and fluffy. Add the eggs one at a time, beating well after each addition. Add the vanilla and beat well. You probably need to stop and scrape down the sides of the bowl a few times before everything gets mixed thoroughly. In a separate bowl, whisk Ingredients B lightly until no lumps remain. If you need to, you can sift the dry ingredients to remove any lumps. Add a third of Ingredients B to the butter mixture and beat well. Next, add one-third of the yogurt and water and beat well. Repeat this sequence until all of the ingredients are used up. You will need to scrape the sides and bottom of the bowl several times to make sure that everything is properly and thoroughly mixed. Scoop the batter into the prepared muffin tins. Bake in the oven for 20-22 minutes for each batch of muffins. Muffins are done when the cake pulls away slightly from the sides of the pan and a cake tester comes out clean after being inserted in the center of a muffin. Keep an eye on these cakes as you definitely do not want to overbake them. Remove from oven and cool in pan for 15 minutes before removing from muffin tins and cooling completely on a rack. I know it’s hard to resist as the smell can drive you crazy but these cakes actually taste better the next day! 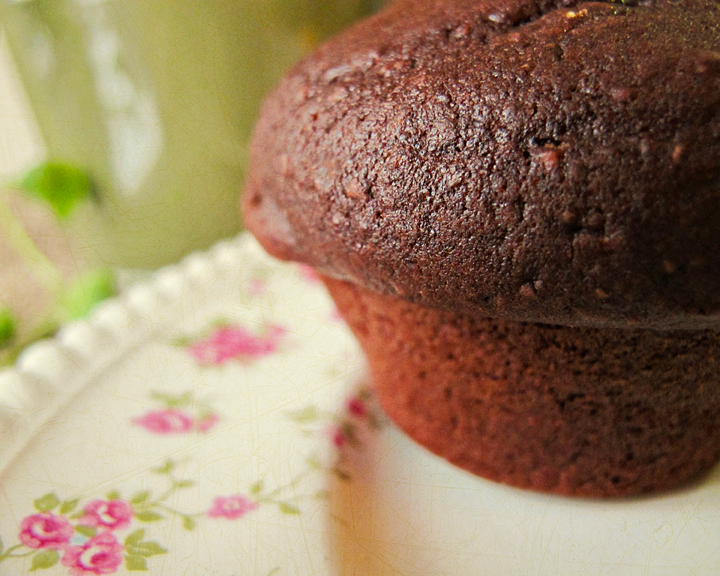 The texture is incredibly velvety and the muffins end up being light and fluffy while staying rich and moist at the same time. You can either serve it warm (zap it in the microwave for about 20 seconds) with a scoop of ice-cream or just eat it as-is. They’re yummy either way.